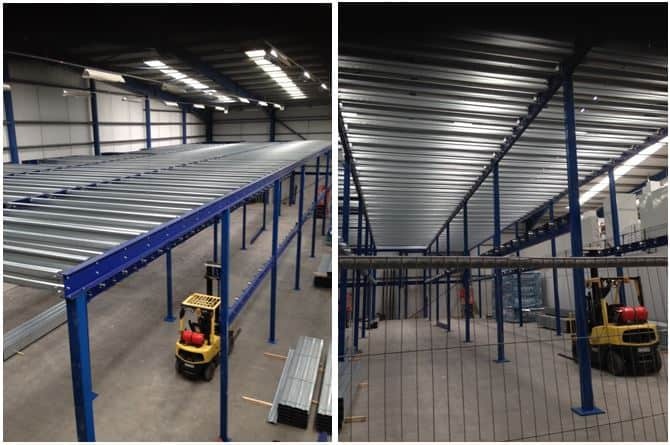 Storage Concepts have just started the installation of the first of two, two tier mezzanine floors in Leicester with fire rated ceilings. The shelving, pallet racking and goods lift is due to be installed in the next few weeks. Our mezzanine floors are a great way to make use of any wasted space, and they are the perfect solution when it comes to increasing storage capacity. Our mezzanine team has years of experience when it comes to designing and building mezzanine storage areas, warehousing, production facilities, retail areas, offices and showrooms that match your organisation’s requirements exactly. If you would like to take a further look at information about our mezzanine floors, please go to the ‘Mezzanine Floor’ section in the ‘Storage Concepts’ tab of our website.